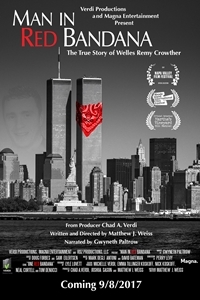 "Man In Red Bandana" is a documentary film about the inspirational story of an American hero - Welles Remy Crowther. Welles worked on the 104th floor of the South Tower and saved many people on September 11th. Tragically, he died that day but his heroics became known eight months later as a result of an ordinary item - a red bandana.The film re-traces Welles' courageous actions that fateful day, and examines the many people (family, friends and strangers) who have been inspired by Welles' actions and the unique ways in which they have honored him.